BaxterSports is excited to offer team soccer camps this summer. 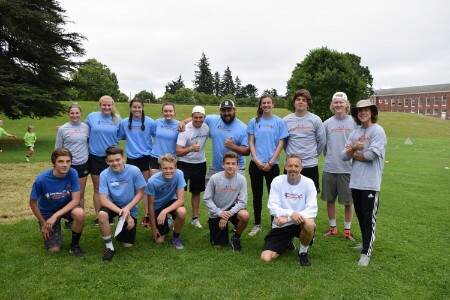 In conjunction with our mission to support the whole athlete, we have adapted our award-winning soccer camp to meet the specific needs and goals of local Portland teams. In 2018, we recognize that many teams play together during their regular season as well as their off-season. The bonds formed between players who have grown up learning soccer together are an invaluable asset on the field, and Brian Baxter and his team are excited to help strengthen that teamwork. This Summer, sign your entire team up for a personalized Team Soccer Camp that Brian and the coaches will design to help your team meet its unique goals for the upcoming season. Our Team Camps nurture the bonds of collaboration and sportsmanship that already exist within your team, while challenging your players to work even better together towards a common goal. "The strength of the team is each individual member. Our weeklong, afternoon Team Camps are run by professional instructors, all of whom are former competitive soccer players with decades of coaching experience between them. Brian Baxter, our Founder and Sports Director, has over 20 years of experience coaching and developing young athletes and has gathered a team of enthusiastic experts who are all equally committed to your team’s success. We build from our successful day camp structure – technical drills, combination play, mini-tournaments and scrimmages – and highlight the improvements you want to make, from attacking moves to defensive strategies. By incorporating strategies from youth Sport Psychology into our personalized camps, our instructors support both the physical and mental well-being of teams and players. We work with you to improve team unity through communication, coaching, and teammate support structures, as well as a positive mental game. We help players and coaches alike develop mental strategies in tandem with increased physical skill sets. How the team feels about its potential for success is often as critical as footwork, coordination, and the physical game plan. We want our players to perform well under pressure and to work well together, so we introduce new ways of thinking about the game and each player’s role within it. The whole athlete is important, from what he or she eats to what they think and what they do when they get the ball. It’s time to grow together as a team, to sharpen your instincts, and to get ready for the upcoming season. Team Camp will help you learn new skills and sharpen up old ones by working together. Instead of an individual player progressing without the team, all players will grow equally strong and smart on the field. By working to be a better teammate, each player will grow as an individual contributor as well as an essential member of the group. At BaxterSports Team Soccer Camp, players gain a deeper understanding of the soccer community, from the locker room to the field and the league you play in. Team exercises can be perfected and new drills incorporating better on-field communication can be added to your team’s routine. We work especially closely on updating your strengths and adding complimentary, advanced moves, plays, and techniques. By watching your team in action, we can also offer objective feedback to help your team solve unknown problems or fix subtle gaps in play. Our camp is adaptive and supportive to your specific needs. BaxterSports Team Soccer Camps foster a strong sense of community between teammates, between players and coaches, and teams and the community. We encourage our players to take our lessons about healthy eating, respectful communication, and positivity back to their league. Our ultimate focus is on sportsmanship, from the field to the classroom and beyond, and we know that by growing as a team over the summer, the benefits during the season and all year long will be limitless. Sign up for a Sports Camp today! Probably the most fun your child will ever have at a sports camp. Sign them up and let your little ones be the judge!